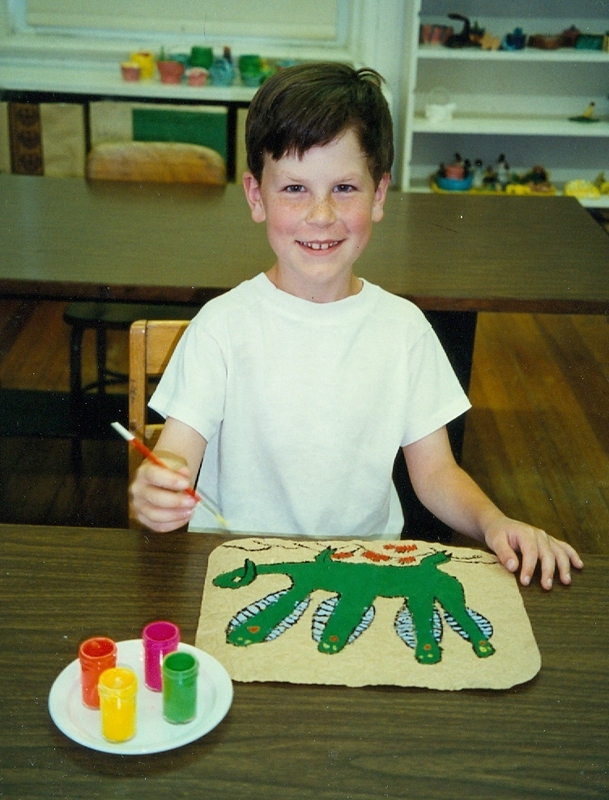 The children add texture to their papers before making Amate bark paintings, a traditional Mexican folk art. For ages 6 to 13. Plan 3 to 4 sessions. 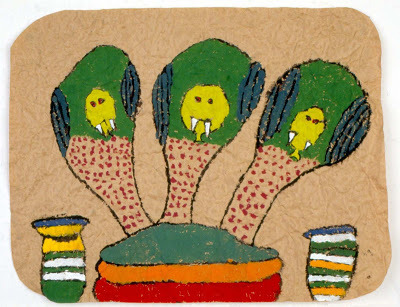 Click here and scroll down to see three examples of Mexican bark paintings. 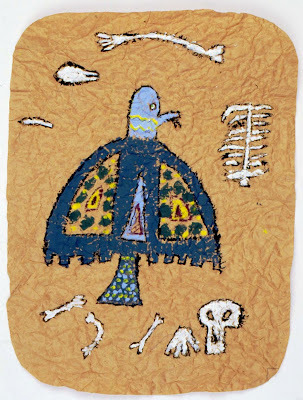 The Otomi Indians of Mexico make beautifully textured paper with strips of bark from Amate trees which are boiled in a water and ash solution until soft, laid crisscross and overlapping on a board, and pounded with stones until the fibers mesh into a paste. Left to dry in the sun, this process creates a strong paper that clearly shows the texture of the bark. The village people use this paper to make highly decorative paintings that usually include flowers, birds, animals, or scenes from everyday life, depicted in a fanciful manner. The unpainted background makes a strong contrast between the brilliant, sometimes fluorescent, colors of paint and the rich texture of the handmade paper. Set out the brown paper, pencils, and waxed paper. Prepare a safe area for the iron using a thick pad of newspaper to protect the work surface. Place single sheets of newspaper nearby to use between the waxed paper and the iron. This area must be supervised by an adult. 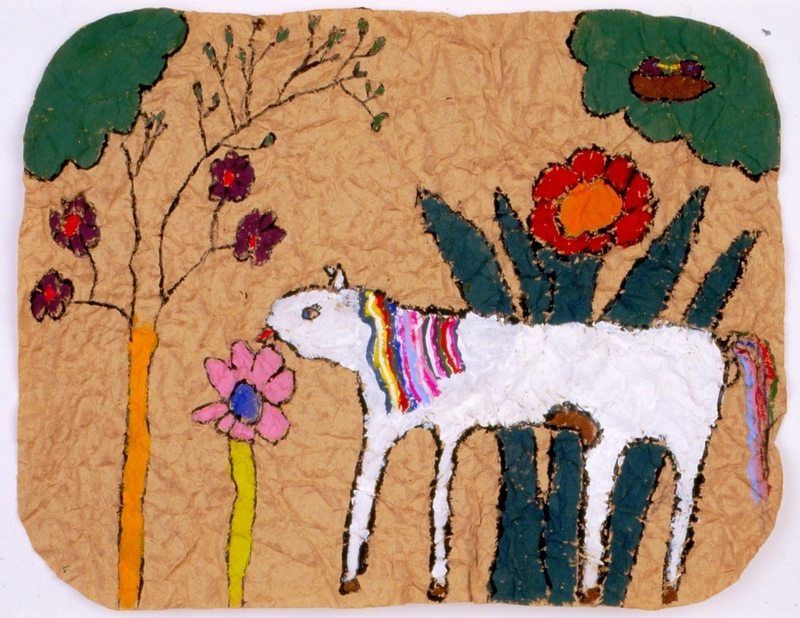 Show the examples of bark paintings while telling the children about the Otomi Indians and their handmade paper. 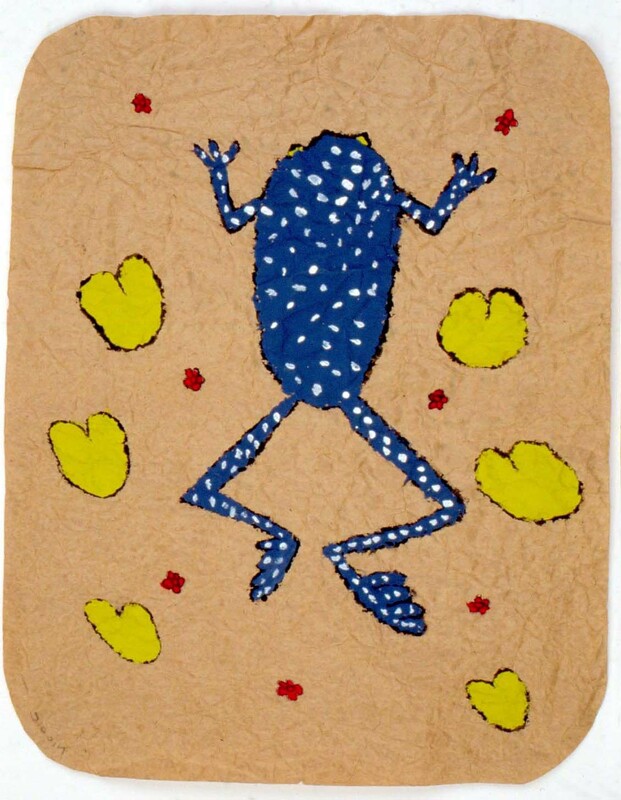 Explain that the children will be adding texture to brown paper before painting in the style of traditional Amate bark paintings. Point out the characteristics of the bark paintings: they are fanciful, or imagined, rather than realistic; they include images of flowers, birds, animals, or scenes from village life; they are painted with brilliant colors; and the background is left unpainted. While waiting to use the iron, have the children plan their drawings on sketch paper. They should then transfer the basic outlines of their drawings to the ironed papers using light pencil lines; do not draw in details at this time because they will only disappear when the first coats of paint are applied. Test the black paint to be sure it is thin enough to flow easily on the textured paper while retaining its blackness. Fill small containers with black paint planning one for each child. Set out thin paint brushes, black paint, and textured papers. In this session the children will be going over the pencil lines on their textured papers with thin black lines. Demonstrate how to paint on the textured paper: use a thin brush, dipping it often in the paint and tapping it against the lip of the dish to avoid splotches of paint on the paper; paint with a sketchy motion to get the lines to fill in along the textured paper; use light pressure with the brush to keep the black lines from becoming too thick. Have the children cover all their pencil lines with the black paint. Set the papers aside to dry. Set out white and brightly colored tempera paints, such as turquoise, yellow-green, magenta, hot pink, orange, and purple. Set out paint brushes, textured papers, and optional fluorescent paints. In this session the children will be adding colors to their bark paintings. They should paint inside the shapes only, allowing the black lines to show and keeping the background unpainted. Encourage the children to use the white paint for highlights and to create strong contrasts. Have the children use their imaginations to paint the shapes with fanciful colors and designs; anything goes - a purple horse, blue leaves, or a flower of many colors. The optional fluorescent paints are fun and will add sparkle to the paintings. In order for the children to understand Amate bark painting, it is important for them to see an example. When transferring the designs for the bark painting, the children should use light pencil lines because dark lines are hard to erase without damaging the texture in the paper. Mixing brilliant colors like hot pink or lime green as a group saves time and lets the children see how the colors are achieved. The bright colors of liquid tempera paint work very well for this project. The more expensive fluorescent paints can be used to add a touch of sparkle to the final paintings. If the paint doesn’t stick to the surface of the textured paper, add a drop or two of liquid soap. For another Mexican folk art using paper prepared in the same way, see the lesson on Amate Paper Cutouts. Review the characteristics of Amate bark paintings. Ask the children to explain the difference between fanciful and realistic figures. Discuss what makes some colors stand out more than others. Do I have to redraw this picture on my textured paper? Uh oh! I dripped on the background. A lot of my black lines are way too thick. I’m finished with my black lines and I’m ready to put on my colors. Oh no! Now I covered my black line with the red paint! Only draw the basic outlines of your plan on the textured paper. Details will be included after you apply the first coat of paint. To avoid drips, don’t overload your brush - instead, dip often and tap your brush on the edge of the container. If you get a drip where is shouldn’t be, try to make it part of your design. Areas where your black lines may have become too thick can be covered with the colored tempera paint in the next session. Wet black paint will mix with the colors and make them dull, so we need to let the black lines dry before continuing. You can reapply the black line after the red paint dries.